So, you have an idea for a business. Now what? Join Judith Weiss in this mentor-supported program that gives you the structure and support you need to set your sights on the future. Learn the fundamentals of what it means before you start your own business. 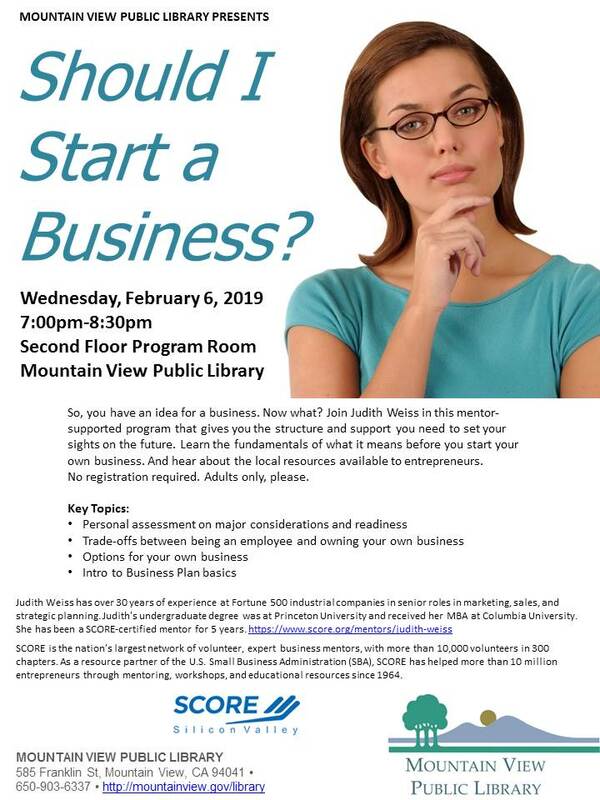 And hear about the local resources available to entrepreneurs. No registration required. Adults only, please. Judith Weiss has over 30 years of experience at Fortune 500 industrial companies in senior roles in marketing, sales, and strategic planning. Judith's undergraduate degree was at Princeton University and received her MBA at Columbia University. She has been a SCORE-certified mentor for 5 years. This program is brought to you by SCORE, the nation’s largest network of volunteer, expert business mentors, with more than 10,000 volunteers in 300 chapters. As a resource partner of the U.S. Small Business Administration (SBA), SCORE has helped more than 10 million entrepreneurs through mentoring, workshops, and educational resources since 1964.